I’m fortunate to have access to both DMR and Yaesu’s System Fusion and WiresX digital networks; and, I want to share my experiences with you regarding both digital networks. In this BLOG I will, at a 50,000-feet level, generally talk about the two digital networks I use for my HAM operations: DMR and System Fusion WiresX. I won’t get into details about the technology; because, you can get all that stuff on the Internet. The purpose of this BLOG is to help you decide the type of digital transceiver you should get, based upon my usage experiences, if you only had to choose one digital network: DMR or System Fusion WiresX. Digital Mobile Radio (DMR) was created by a telecommunications entity in Europe for professional and commercial communications and has become the international digital platform for digital communications throughout the world. Because of its vast coverage, it’s used by many Fortune 500 companies, military, government agencies, law enforcement departments, fire departments, aviation industry, medical industry, transportation, utility companies, and so on. Motorola chose DMR as its digital network. They believed in DMR so much, they bought a piece of DMR and created their own flavor called, MOTOTRBO (Turbo), and it has specific features just for Motorola and their customer base: names, ID numbers, GPS information, GPS in-building tracking, man-down emergencies, direction, back-tracking, emergency channels, mobile calls, radio calls, text messages, call alerts, group management, contact information, job orders, and so on; it is fully customizable for the commercial and professional users. Yaesu created their own proprietary digital C4FM network called, System Fusion, and with it, they created an enhanced repeater called WiresX. WiresX provides many features, but the major up-front feature is the portal page, similar concept to a website portal page, which provides a list of talk Rooms for the HAM operator (operator). 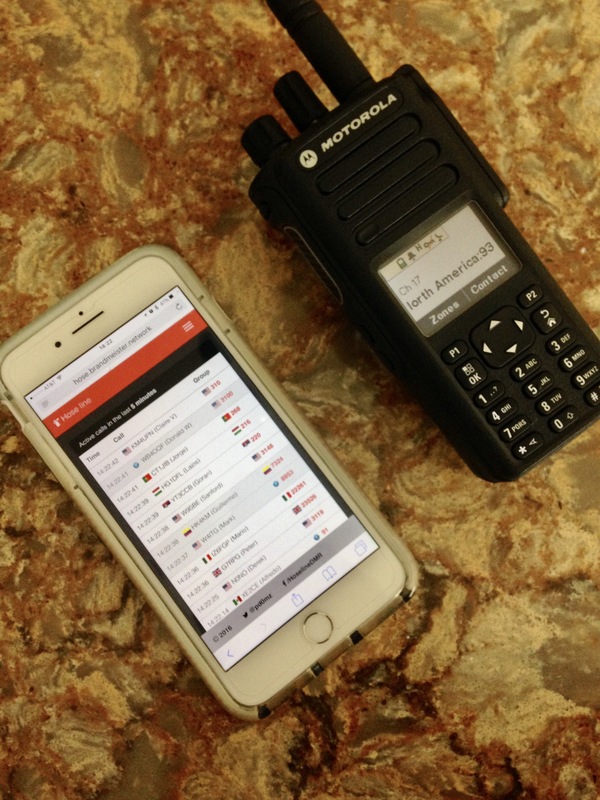 Yaesu, unlike DMR, created this digital platform specifically for the amateur HAM operator, and marketed System Fusion and WiresX to be easier to use right out of the box. DMR operators, on the other hand, is not that simple — especially, if, you, the operator is a newbie. DMR operators need to create code-plugs, via a Windows-based personal computer, in order to get their transceivers to work on the DMR network; and, those code-plugs ain’t easy to create — it takes time and research; and, if the operator is a Motorola operator, it will not only take time, but it takes a learning curve to understand the CPS’s (Customer Programming Software) hierarchy and protocols — oh, and Motorola operator needs to purchase the CPS software, which can cost up to $360…oh, that is, if Motorola approves you to buy the CPS. DMR uses the concept of Talk Group IDs; and, these Talk Group IDs are directly associated and accessible via the DMR repeater — in other words, just like analog repeaters, all the operator has to do is connect to the repeater, and the operator is automatically connected to DMR. With a turn of a dial or push of the directional buttons, the operator immediately accesses his desired Talk Group — no additional connection, and no disconnection issues; but, there’s a catch…the operator must , enter each individual Talk Group ID into his code-plug — DMR does not create a list of Talk Groups in their networks — there is no up-front built-in portage page. If you wanna talk to operators in Italy, well, you gotta find the Talk Group ID for Italy, and enter that Talk Group ID into your code-plug. Once the list of Talk Groups are entered into the code-plug and written to the transceiver, then a list of Talk Groups show up for the operator to scroll through and access. Yaesu uses nodes, which they call, Rooms. Activate the WiresX, and you are presented with a list of Rooms. Enter a room, and you can talk to operators in that room. Each Room has its own discussion topics — wanna talk to operators in Italy, then with a turn of the dial, go through the list of Rooms to find the Italy Room. Press enter, and you’re connected in to Italian operators in that room. DMR operators are automatically connected to the DMR network via connection to the repeater. This is a direct, stable, and more reliable connection than Yaesu’s System Fusion and WiresX in my experiences. After the user creates his DMR code-plug and writes it to his transceiver, he is rewarded with instant and reliable global access to the DMR Talk Groups in his code-plug — no extra connection routes, via modem, to the Talk Group, and no disconnect issues requiring reconnections like System Fusion and WiresX. With System Fusion and WiresX, the operator needs to connect to the repeater. After connection to the repeater, the operator needs to change to the DN band. After that, the operator needs to press the DX button to activate WiresX, via modem, in oder to get the list of Rooms on his transceiver. After the connection to WiresX gets established, the operator is in the local room; and, if he wants to access other Rooms, domestic and international, he has to hit the enter button again to get the list of domestic and international rooms in his transceiver, via WiresX — thereafter, he has to scroll through the list, and press enter to connect to that room, via modem. Since System Fusion and WiresX is not as robust and global as DMR, availability to a repeater is limited to the operator; and, modem connection stability is always an issue. Many times, due to my proximity to the only three San Francisco System Fusion WiresX repeaters, I cannot connect, or I get disconnected. Since DMR is more used in the San Francisco Bay Area, all I need to do is to connect to a DMR repeater; and, I’m automatically and reliably connected to any Talk Group that I programmed into my code-plug: domestic or international — I have never been disconnected, unlike System Fusion and WiresX. Yaesu has two dedicated hand-held transceivers that are out-of-the-box ready for activation to System Fusion and WiresX: FT2D and the FT1XDR, which I own and use. Popular DMR commercial and professional transceivers are Connect Systems, Kenwood, Hytera, TYT, and Motorola, which I own and use. These transceivers are not out-of-the-box ready for DMR connection — they need to be programed via CPS to create code-plugs, which needs to get written into the transceiver. For many HAM operators, this is a deal-breaker…many HAM operators don’t want to invest the time, money, and energy to create code-plugs, especially when other C4FM digital networks come packaged in the transceivers without any need to create code-plugs. A reason exists that allures other HAM operators to travel the rugged path riddled with mountains, valleys, and the unknown — the reward is the ability to use one of the best and most vast digital networks in the world — DMR. HAM operators go through the arduous and time-consuming efforts of creating code-plugs to get their transceivers on the DMR; because, of its high quality and reliable digital RX and TX features and capabilities, and DMR is the top-of-the-line and state-of-art digital network available. One of the features that make DMR so advanced is it has the best forward error correction algorithms available at this time: AMBE VoCoder. AMBE VoCoder was developed by a bunch of super-smart mathematicians and engineers from all over the world: India, Taiwan, Germany, USA, and so on. They worked on creating digital algorithms, called AMBE VoCoders, to execute forward-correction of errors in the digital voice packets. The AMBE VoCodor, via its analysis from the algorithms, goes to a list of pre-made digital synthesized voices, and AMBE VoCoders selects the best synthesized voice match for the human operator transmitting over his transceiver. In other words, my voice going over the DMR is not really my voice — rather, it’s the best synthesized rendering of my voice picked from a list of digital codes that best matches my real voice and gets created in such a way that is effectively and efficiently transferred over the DMR network with the least amount of error. So, the listener on the other end receiving my transmission, gets to hear a robust, clear, and strong digital rendition of my voice going into his transceiver without drop-outs, background noises, and other types distortion — all this stuff is done at 2450 bits per second — pretty impressive, eh? Well, I think so. Here is a video of a HAM Operator from the UK with whom I made contact: DMR Motorola XPR 7550e. The AMBE VoCoder is a RX and TX feature that exists not only in the DMR network; but, also in the CPU of the transceivers. Motorola uses the AMBE VoCoder in their MOTOTRBO transceiver’s CPUs. This technology is used world-wide by all commercial and professional entities: military, department of defense, secret service, race car drivers, aviation, education, medical, corporations, government agencies, law enforcement departments, fire fighting departments, and so on. The DMR sound quality in RX and TX is superior to System Fusion and WiresX, and another digital platform called, D-Star. Yaesu’s System Fusion and WiresX technology uses the digital C4FM technology; and, one of the main features is its ability to automatically switch between analog and digital TX based upon the operator — if the operator is using C4FM, System Fusion will maintain the digital TX and RX; and, if the user is using FM analog, System Fusion will automatically switch to analog FM for TX and RX. The System Fusion C4FM also provides the bandwidth and the use of modems to send voluminous amounts of data, such as pictures. Users can upload and download digital images (e.g., pictures), send and receive individual and group text messages, and telemetry while having a conversation with another operator on System Fusion. System Fusion also provides GPS information allowing operators to send GPS information to a group of operators or individual operators; but, another really cool feature is the GPS back-tracking. If an operator gets lost in the woods, he can use System Fusion to back-track his trail to get back to his originating location. Here is more information about System Fusion C4FM technology. So, although DMR doesn’t provide this data out-of-the-box, individual companies, like Motorola’s MOTOTRBO Capacity Plus provides the same type of features as System Fusion but more and with better reliability and accuracy. With Motorola’s MOTOTRBO Capacity Plus, a company can track its operators, get and send GPS data, send and receive emergency transmissions, like man-down, group or individual text messages, job service requests, radio calls, mobile cellular calls, GPS navigation, call alerts, and Wi-Fi features. DMR is a public network; and, individuals and companies can build data-rich software from the DMR network, just like Motorola’s DMR MOTOTRBO. Yaesu System Fusion and WiresX is proprietary and doesn’t allow the user to customize. You can read more about DMR. In addition to using DMR, I met awesome helpful HAM operators from all over the world that are on the cutting edge of DMR technology on all levels: social, commercial, professional, and security. One of the many things I like about the DMR network is the level of sophisticated HAM operators. Since DMR wasn’t intended for HAM operations, it is not user-friendly; hence, the inference I like to make about HAM operators using DMR is that they are more on the edge of HAM technology; because, they are constantly finding ways and new equipment to make DMR easier to use and obtain and send out more information throughout the DMR network. Because it is so difficult to set up your transceiver to use DMR, HAM operators really have to understand DMR in order to get their transceivers to work; and, through this level of understanding that new ideas spawn, such as, the group of individuals that created, Brandmeister. Brandmeister is an important ancillary to DMR; because it provides features and benefits to DMR HAM operators: connection to APRS.fi, viewing and listening to active Talk Groups via Hoseline, presenting operator’s names and call-signs via Hoseline, and bridging the different digital networks together (e.g., D-Star, System Fusion and WiresX, and DMR). Unlike System Fusion and WiresX, DMR is a large and robust global network for professional and commercial use; hence, it is available throughout the world. It was never designed for the amateur HAM operator; but, it is highly customizable for the specific needs of its professional and commercial users, unlike System Fusion and WiresX. Out-of-the-box, Yaesu’s System Fusion and WiresX delivers GPS information, call-sign, and name to other Yaesu digital transceivers using System Fusion and WiresX. DMR users just get a DMR-MARC radio ID number consisting of seven digits. So, if the DMR user wants to know the name of the operator, he has three ways of getting the name of the operator he is talking to: verbally ask for the name; visit the DMR-MARC user database; or, activate the Brandmeister Hoseline, via mobile smart-phone, lap-top, or desk-top. Thereafter, the DMR operator can enter his name, DMR-MARC ID, and call-sign into his transceiver; and, the operator’s name in the contact database of the transceiver will show up on the screen of the transceiver each time they enter into the same Talk Group. Presently, TYT DMR operators have a work-around software to get the DMR-MARC database automatically imported or dumped into their code-plugs, so they don’t have to enter the information manually or visit the DMR-MARC database or Bandmeister’s Hoseline. They also have code-plugs that show and give out GPS information. Presently, Motorola DMR operators are working on the same type of work-around software to get the DMR database imported or dumped into their code-plugs, so they have to enter the information manually or visit the DMR-MARC database or Brandmeister’s Hoseline. So, while Yaesu displays the operator’s name on the screen of the Yaesu transceiver up front, the Yaesu transceiver cannot store the name, like the DMR operators can do with their DMR transceivers. Will the digital networks replace analog? No. At the end of the day, if there is a civil upheaval or a catastrophe, radio frequencies, analog, will still work and won’t be affected by power outages. When 100% guaranteed power redundancy is effectuated for digital, then, and only then might digital replace analog. Analog is still the medium for emergency and catastrophes. The other thing to consider is it is easier to access analog and simplex than it is to access DMR; and, this is another reason that analog is still the medium of choice for emergencies and catastrophes, like earthquakes, storms, hurricanes, and so on. In my experiences, DMR provides better sound quality on RX and TX; DMR is more reliable and provides easy connection to the Talk Groups; DMR is globally available throughout the world. So, even though it requires a lot of front-end programming and customization, via CPS and code-plugs, DMR’s quality, reliability, and accessibility is better than Yaesu’s System Fusion and WiresX. So, if I had to choose one over the other, I would choose DMR. At the end of the day, damn, I hate saying that, “at the end of the day,” it reminds me of my Corporate America days…but, okay, at the end of the day, for me, it’s about expanding my knowledge and experiences AND meeting new people within and outside of the United States; so, while some operators wanna be exclusive to DMR or System Fusion and WiresX, I prefer to use both; because, I met awesome operators on both digital networks. if you are more interested in out-of-the-box instant access to a digital network coupled with easy-to-use, pre-fabricated non customizable front-end user features, then Yaesu System Fusion and WiresX might be the network for you. If you are more interested in the use of state-of-the-art, advanced feature-rich, customizable TX and RX technical features, like AMBE VoCoders, reliable one-stop connection to Talk Groups, highly customizable open-source programming for your specific needs, then the DMR network might be for you.